In Boise, Idaho, District 7 CWA leaders focused on ways to make CWA STRONG, joined solidarity actions at two AT&T Mobility stores, and held bargaining unit meetings covering AT&T Mobility; Public, Healthcare and Education Workers; Telecommunications and Technologies, and CenturyLink (legacy). The contract covering 12,000 workers at CenturyLink (the former Qwest Communications) expires in early October. Delegates elected bargaining committee representatives and moved forward on bargaining strategy. 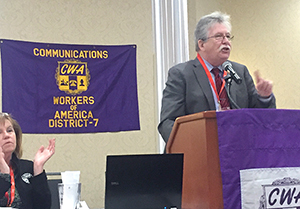 CWA President Chris Shelton spoke at the conference and commended D7 members and Vice President Brenda Roberts for their solidarity and determination to build our union. CWA President Chris Shelton commended D7 members and Vice President Brenda Roberts for their solidarity and determination to build our union, noting that since the last district conference, more than 1,000 new members have joined CWA. Shelton outlined the attack on workers and unions that’s in full swing, with public workers in Iowa the latest to lose their bargaining rights. "But CWA is relentless. We don't stop," he said, citing long fights for collective bargaining rights in New Mexico, for legislation promoting good jobs in Minnesota, and other campaigns throughout the district and CWA. That determination is the heart of CWA STRONG, an action plan to talk to every eligible employee and bring them into the union as a member, then an engaged member, and finally an activist, Shelton said. District 7 Vice President Brenda Roberts said that District 7 members are all in for CWA STRONG. Roberts, who is leading CWA's customer service initiative, outlined actions set for Customer Service Action Week starting April 17 and the push for signatures on the petition to Congress to pass the U.S. Call Center Worker and Consumer Protection Act, HR 1300 and S515. 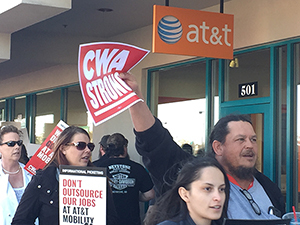 CWA members rallied outside an AT&T Mobility store. The 200 delegates rallied at an AT&T Mobility authorized retailer, then moved on to an action outside a corporate store on Sunday, calling on AT&T to reach a fair contract and stop outsourcing work. Teams from the conference also visited a T-Mobile call center and collected petition signatures from workers there. Speakers included CWA Secretary-Treasurer Sara Steffens; T&T Vice President Lisa Bolton; Frank Arce, Local 9400 and a CWA executive board diversity member; and several elected state political leaders. District 7 CWA leaders gathered in Boise to discuss ways to make CWA STRONG, joined solidarity actions at two AT&T Mobility stores, and held bargaining unit meetings.